Work From Home Warnings What is Classified Commissions big secret? What is Classified Commissions big secret? Nothing is new in this world we live in, at least not in terms of products. It always feels like the same old stuff is going around, being regurgitated out: the same stuff just twisted slightly. Internet Marketing products are no different, hell; they may be the worst ones for it! This week’s product is another take on a system that has been around the block so many times, everyone seems to know its name: classified ads. The product itself is called Classified Commissions. Naidy Phoon, the Malaysian author behind this product is a young buck in the marketing industry and he is trying his hands at making a few dollars with his own products. His pitch is straight forward marketing blurb, trying to leverage your hopes, doubts and fears into making a sale. The sales pages espouses you can make money with just 20 minutes of work a day, which seems more like a push button system than something grounded in reality. As always, the author provides proof of earnings which could have come from anywhere and any system, which are there to help make you believe that this product will be the next big thing in your journey of making money online. That’s some interesting phrasing. It reads like a child can do this and that you are guaranteed to make money. From my own experience children can’t generally do things like this (barring that 14 year old whose on his 3rd business, but he’s an anomaly! ), and nothing in this world is guaranteed, especially making money from an $8 dollar e-book! As mention, the front end offer was $8 bucks when I picked it up, but it is on a dime sale which will cap ay $9.95. Of course, the upsells follow. 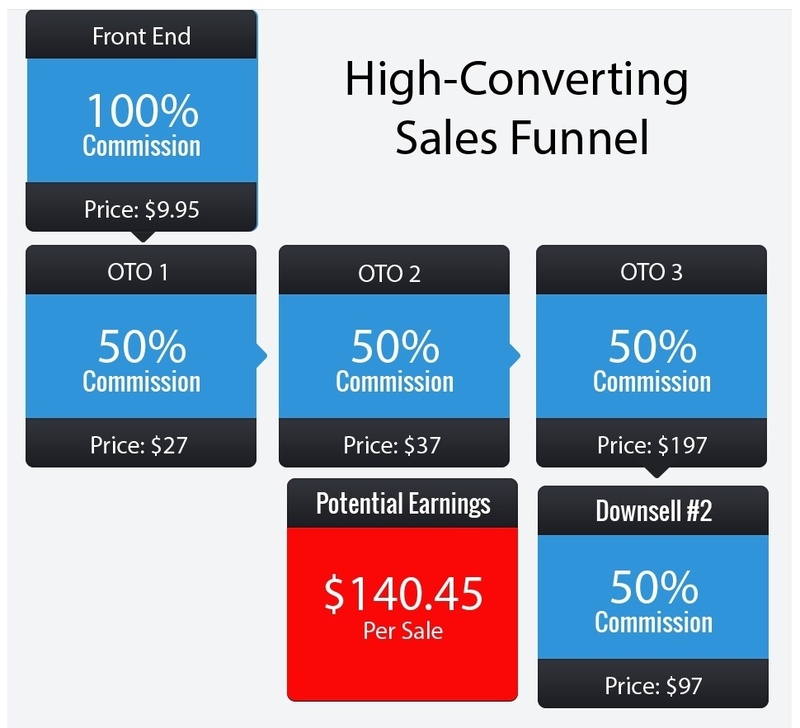 The first upsell eases you into the funnel and for $27 you too can own more information such as done for you emails, traffic generation tips and a list of high paying affiliate networks. Declining that will actually pull you out of the funnel, but according to the affiliate page, if you purchase it you will then be offered two more upsells. The second upsell is for $37 and is regarding selling physical products without touching them (I’m reading drop shipping into that). The final upsell is for a coaching program at a hefty $197. The e-book itself is a 42 page tome in a spaced out font with enough images to break up the monotony or text. It focuses primarily on business opportunities and making money online systems which is your typical target audience for a making money online product! As such it is targeting the jobs section within classified ads, but also uses a traditional funnel technique in order to, well, make money. This section covers how to selct an appropriate product to promote. It’s fairly brief but gives some real world examples of products and assesses them for suitability. The machine in question is basically an autoresponder sequence. The author provides a full 6 day email example, which honestly I was surprised at. Not that he provided the examples, but of the emails themselves. To me they seemed quite spammy, even though the longest was a few lines long. However, I have not seen this in action, so it might well be that the simplicity of the emails is enough to arouse interest in the product you are promoting. contacted soon should you be approved”. While at this point in the training you may not have a full idea about why you would write such an email, it feels like a trick – why would someone be applying for an affiliate product? 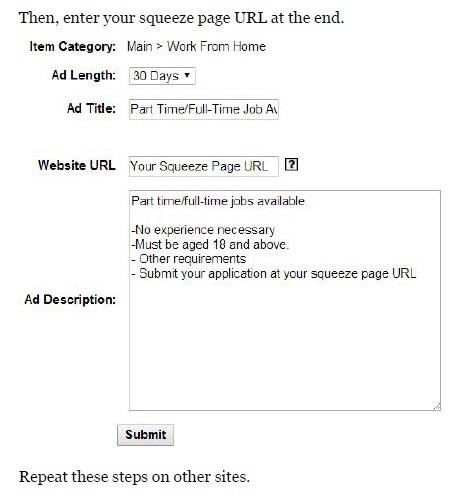 The first part of this section actually covers creating a squeeze page, though as the product is targeting possibly semi-experienced marketers it only covers it in brief, though the content to add to the squeeze page is more detailed. The traffic comes from, you guessed it, classified ads. The point is to put up a job advert and link to your squeeze page. This section covers ways in which you can outsource and otherwise automate the process. While not a scam in one sense as Classified Commissions provides you with something for your money, it worries me that it is teaching you how to scam people! It is telling you to set up a fake job advert and then lead people on until they get through to an affiliate sales page for a product that supposedly helps people either find work or create their own job. Some would argue that it is not deceitful as you are providing the person with a potential way to find work, but personally I see that as a thin argument to cover up what might be a lucrative way to make money, but is certainly an unethical one. As such it’s down to your personal ethics whether this is system is a goof fit for you or not.